Offer Terms: Min £10 stake on bingo within 30 days of registration. Max bonus £30 with 3 x wagering requirements, credited upon successful deposit. Bonus available for 30 days only. BoyleSports Bingo belongs to one of Ireland’s most successful independent bookmakers, the Boylesports Group. The company was established in 1989 by John Boyle, and has an amazing reputation throughout Ireland and the UK as one of the most trusted and high quality betting and gaming services around. 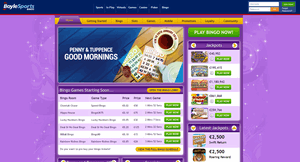 The group has over 115 land based Licensed Betting Offices throughout Ireland, and their bingo site is powered by the well known Virtue Fusion software. The company is registered in Gibraltar, and is licensed and regulated by the UK Gambling Commission and the Government of Gibraltar. The site itself offers players a very professional looking platform which is so simple to use. The layout is clear and players can easily find other gaming platforms created by BoyleSports such as Vegas, Casino, Poker and Lotto, and registration could not be simpler. It takes just a few minutes to sign up to BoyleSports Bingo and the best thing is, if you already have a previous BoyleSports account, then you can log in with those details straight away. BoyleSports Bingo offer a great variety of 75,80 and 90-ball bingo across 10 rooms. These include the Cheetah Chase speed bingo room, 75 and 90-ball Deal or No Deal rooms, and also the recently added Rainbow Riches room too. The bingo Lobby is really easy to find and gives players lots of info as to when new games will begin and how much tickets cost etc. Promotions are aplenty here at BoyleSports Bingo too. The current sign up offer is of really great value, and there’s also daily free bingo, cashback bingo, slots boosters and more. BoyleSports Bingo are currently offering new players a fantastic welcome bonus to get your gaming experience nicely up and running. Click on the link at the top of this page for more details. Terms and conditions apply, and all players must be aged 18 or over to register. There are also plenty of continuous bonuses and promotions on offer for all players too. Every Monday with Cashback Bingo, BoyleSports Bingo will give you 5% cashback on your losses from the previous week. If luck doesn’t go your way, then the cash still will. Everyday form 5pm-6pm GMT, all players can enjoy some daily free bingo. All you have to do is spend £5 on any bingo games that day to qualify,then you can head on over to the Private Hut room for free bingo and amazing cash prizes. If weekend bingo is more your thing, then jump online for Super Sunday. If you spend £15 or more in any bingo room on a sunday, you will instantly recieve a 20% bingo bonus. One of the most exciting bingo bonuses at BoyleSports Bingo is the Random Tuesday Cashdrop. Every Tuesday, without even needing to do anything, you could randomly find a nice little boost work its way into your account. BoyleSports Bingo operates on the highly acclaimed Virtue Fusion network. The bingo on offer at BoyleSport Bingo comes in variations of 75, 80 and 90-ball bingo. There are 10 rooms in total, each offering different games and activities. The Lions Lair, Lucky Numbers, Deal or No Deal and Cheetah Chase all offer fantastic variants of 90-ball games. The Cheetah Chase room games are played at super high speed for all those gamers on the go! Baboon Bargains is a room entirely unique to BoyleSports Bingo for players who like something a bit more personal, and Zebra Stripes offers pattern style bingo for something a little diverse. BoyleSports Bingo have also recently added the fantastic Rainbow Riches room, where lots of Irish Luck will hopefully win you those big cash prizes. Boylesport Bingo also offers up a wide variety of additional games too including many slots, scratch cards, casino and numbers games. Popular slots titles include Shaman’s Dream, Fluffy Favourites, Who Wants To Be A Millionaire and Amazon WIld, plus there are also a fantastic selection of progressive jackpot titles too such as Chests Of Plenty and Pet Luck. Players can also find several scratch card titles such as Wintry Wonderland and Big Bounty, number games like Hi/Lo and Keno and also classic casino table games including Blackjack and 3 Card Brag. As mentioned before, the site also offers navigation to all other BoyleSports gaming platforms too. There’s a huge variety of payment methods accepted on BoyleSports Bingo, arguably one of the largest selections around! Please make sure you read all terms and wagering requirements upon registration, as these are subject to change at any time. Processing time may take longer depending on certain card/banking sytems and bingo wagering requirements are 3x bingo bonus. BoyleSport Bingo provides a clear, professional platform with fantastic games and great prizes. The BoyleSport brand is established and trusted, with a history of exceptional customer care and loyalty towards its players.